A U.S. judge sentenced an 84-year-old nun, Sister Megan Rice, on Tuesday to 35 months in prison for breaking into a Tennessee military facility used to store enriched uranium for nuclear bombs. Two others accused in the case, Michael Walli and Greg Boertje-Obed, were sentenced to 62 months in prison. The three were convicted of cutting fences and entering the Y-12 National Security Complex in Oak Ridge, Tennessee, in July 2012, embarrassing U.S. officials and prompting security changes. They spray painted the buildingâ€™s north wall, which was designed to withstand the impact of aircraft but not the words of the Book of Proverbs. They poured and splashed blood that had once been in the veins of a painter-activist named Tom Lewis, one of the Catonsville Nine who, on Hiroshima Day 1987, hammered on the bomb racks of an anti-submarine plane at the South Weymouth Naval Air Station near Boston. 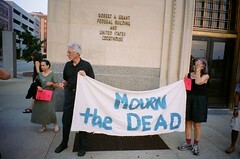 In 2008, Lewis died in his sleep, and his blood was frozen so that he might one day participate in one last Plowshares action. In bright red rivulets, the last of Tom Lewis streaked down the concrete. 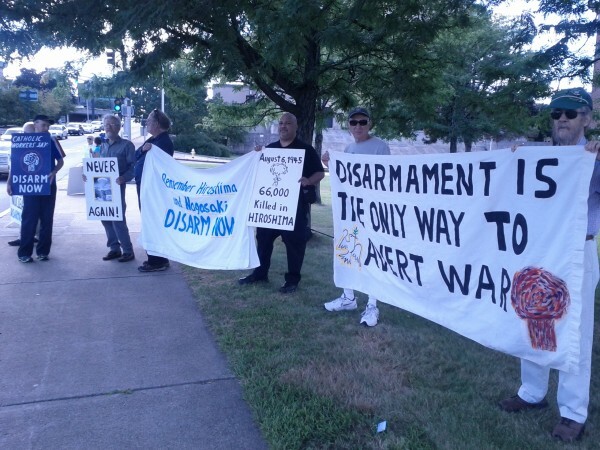 13 people gathered in Worcester’s Lincoln Square today to repent, as Americans, for the 1945 atomic bombing of Hiroshima and Nagasaki, and to call for nuclear disarmament. The President of the Pontifical Council for Justice and Peace, Cardinal Peter Turkson, is in Japan for the â€œTen Days for Peaceâ€ inititative, which is marked in every diocese of the country to mark the 10th anniversary of the nuclear bombing of Hiroshima and Nagasaki, which took place on the 6th and 9th of August, in 1945. He spoke on Tuesday morning at a meeting of inter-religious leaders. “According to Catholic belief, God made man for life, for freedom and for happiness. And yet our destiny here on earth, much of the time, seems to consist of suffering, which we are tempted to undergo as chastisement or punishment, as a cruel fate. Such senseless suffering can eventually defeat us. “Individuals and societies are always tempted by the passions of greed and hate; but they do not have to succumb. Instead of excluding those who are deprived, let us meet their needs. Instead of avoiding those who suffer, let us accompany them. Instead of cursing what we ourselves suffer, let us offer it up for others. Instead of hiding from todayâ€™s problems, let us together bravely address the social situations and structures that cause injustice and conflict. 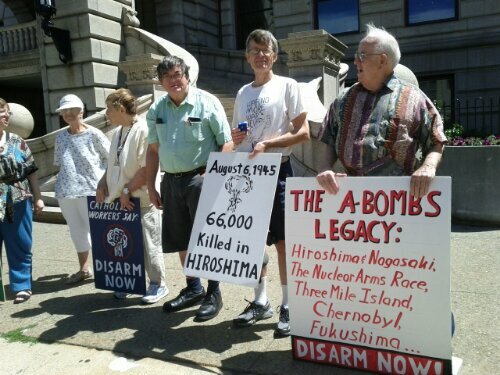 20 people gathered at Worcester City Hall today to repent, as Americans, for the 1945 atomic bombing of Hiroshima and Nagasaki, and to call for nuclear disarmament. 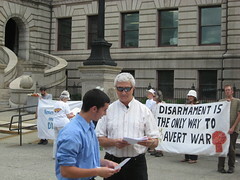 17 people gathered at Worcester City Hall today to repent, as Americans, for the 1945 atomic bombing of Hiroshima and Nagasaki, and to call for nuclear disarmament. Dave Griffith posted his great Hiroshima essay Pictures of the Floating World on his site today, in one of those Scribd-type crazy formats. Subsequent protests led to Father Kabatâ€™s spending more time in prison than out, raising questions about the effectiveness of his approach. 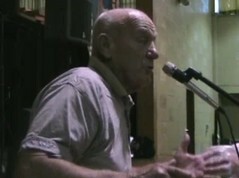 Photo: Carl Kabat at the 2008 Catholic Worker National Gathering in Worcester. 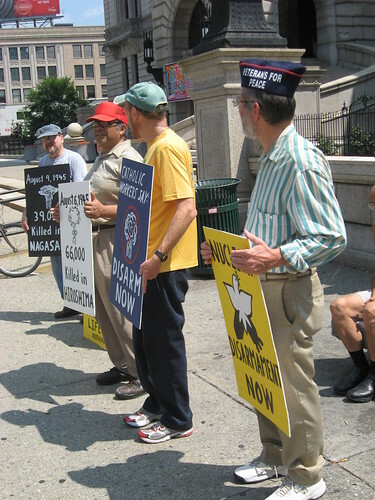 11 people gathered at Worcester City Hall today to repent, as Americans, for the 1945 atomic bombing of Hiroshima and Nagasaki, and to call for nuclear disarmament. A recent poll found that 61% of Americans think the bombing was “the right thing” to do. There are two ways to look at this. Was the bombing an effective way to bring WWII to an end? Was the bombing a horrible crime? I think the answer to the second question is “Yes.” As to the first, Wikipedia is a good place to start. Hiroshima: Was It Necessary? is another introduction. 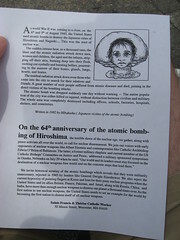 August 6 is the anniversary of the atomic bombing of Hiroshima. August 9 is the anniversary of the atomic bombing of Nagasaki. 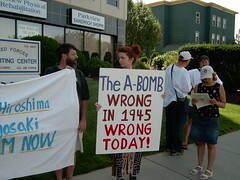 One year in South Bend we held a Nagasaki commemoration and our signs were confusing to passersby. A short, clear sign might be NAGASAKI / 1945 / MOURN THE DEAD. If you have constructive suggestions, or this info is helpful, please post a comment. In a 1980 antiwar protest, these priest brothers, Daniel & Philip, attacked missile warheads at a G.E. plant. I come from Taiwan, or Takasago, as one would call it back in the days of colonization under the Empire of Japan before the end of World War 2. Taiwanese people who are of my grandmother’s generation were educated to be Japanese; for example, the late pastor of my church, like many Taiwanese who were drafted by the Imperial Armed Forces at that time, was to be one of the kamikaze, the suicide pilots who were crashing their fighters into the carriers of the Allies. People of that age often talk to us about the times of the Japanese occupation and the Pacific War. Although they resented the unnecessary War they had to fight and complain about the occasional cruelty of the Japanese, they described the Japanese rule as a period of order and stability, in which even during the extreme of hardship near the end of the War, rarely did riots arise and corruption of the administration were unusual. It seemed that everyone in the neighborhood cooperated to remain organized for the War. I always wonder how this kind of disciplined behavior was attained. After reading John Hersey’s Hiroshima, I think I know a bit more about the way of the Japanese. Although the emblem of the Japanese Empire is the glorious chrysanthemum signifying the Royal Family, common people refer to themselves as sakura, the cherry blossoms, which bloom brilliantly in the spring for a very short time, usually only a few days, and then fall to the ground. A respectful Japanese is one that suffers tragically, or even sacrifices oneself, for the cause of the greater organization (e.g., the Empire, or, as is observed in the modern, post-War society Japan, the kaisha, the Japanese idea of the “firm”), just like the sakura flowers. Any performance less than this is considered a shame in the Japanese mind. The (UK) House of Commons defence select committee took evidence yesterday from Bruce Kent who quoted the Pope about His Holiness’s objection against nuclear weapons, according to BBC‘s Today in Parliament. Sadly, the evidence has not been transcribed on the web (yet), but readers can take a look at the report in the Guardian.